In prehistoric times hunters caught game by following their footprints. 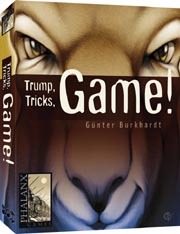 In the game, players try to make tricks to get bear, wolf, wild boar and mouflon cards. In the first three game turns, the number of tricks is predetermined. In the fourth and last game turn, each player must win as many tricks as possible.